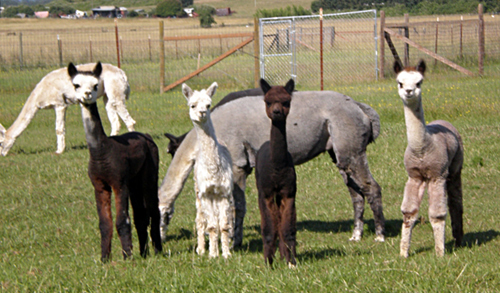 RidgeView Alpacas is a small farm just West of Eugene, Oregon, dedicated to the care of both Suri and Huacaya Alpacas. Established in 1999, we have purposely kept our herd small in order to provide them with personal, top quality care. Currently RidgeView is home to 15 alpacas. Breeding stock and fiber production alpacas are for sale, as well as the services of our herdsire. From the alpacas' luxurious fleece we have roving, batts, yarn, and other handcrafted artisan products. we utilize all of our alpaca gifts (including their "end-product") which helps us to grow an abundance of flowers, organic vegetable and wine grapes. We welcome visitors both large and small. Please come share the lifestyle with us!